* Link : http://www.koreatimes.co.kr/www/news/special/2012/05/181_110143.htmlTo cultivate global leaders, Pohang University of Science and Technology (POSTECH) opened an information technology laboratory at its campus in Pohang, North Gyeongsang Province, Monday.The facility is called the POSTECH Future IT Innovation Laboratory (i-Lab).In collaboration with the Ministry of Knowledge Economy, the i-Lab aims to produce researchers who will become leaders in the field of global information technology.The central government, provincial and municipal authorities, POSTECH, the Korea campus of the St..
* Link : http://www.koreaherald.com/national/Detail.jsp?newsMLId=20120405001028Pohang University of Science and Technology said Thursday that they have created a presidential fellowship with the Japanese company Hitachi to assist students’ science research.The $1.3 million scholarship will be available to students who will conduct research on medical equipment, the major field of study for school president Kim Yong-min.The school noted that the scholarship was created from money left over from the president’s research fund from Hitachi and a donation from the company.They said it i..
POSTECH receives "2012 Role Model in Education" AwardPOSTECH has been selected as the recipient of the "2012 Role Model in Education" Award by the Korean Journalist Federation in recognition of its innovative management and initiative in advancing Korean higher education with customized education. The award ceremony was held at the Korea Press Center in Seoul on March 15. 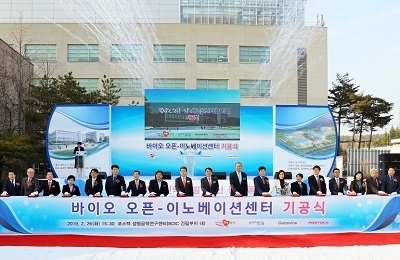 * Link : http://www.koreatimes.co.kr/www/news/biz/2012/03/123_106013.htmlKorean scientists have developed a photocatalyst that can significantly increase the efficiency of producing hydrogen from sunlight, the government said Thursday.The Ministry of Education, Science and Technology said a research team led by Lee Jae-sung, a professor of chemical engineering from the Pohang University of Science and Technology (POSTECH), devised a method to make large quantities of hydrogen.Hydrogen is a key natural resource and has the potential to be used in next generation power cells that may effectively..
A new student exchange agreement has been signed with the University of Tokyo (UT), Japan. President Yongmin Kim visited Japan on the 13th of December to sign the MOU with UT President Junichi Hamada to promote academic exchange and research collaboration between their universities. The agreement underlines a student exchange program to begin in the fall semester of 2012. The University of Tokyo, Japan’s most prestigious university, was founded in 1877 as the first national university. An alma mater of 15 of Japan’s Prime Ministers and 4 Nobel Prize winners, UT hosts 10 faculties, ..
* Link : http://www.koreaherald.com/national/Detail.jsp?newsMLId=20111030000213300 students including Chinese and Japanese expected to join program every yearMajor universities in South Korea, China and Japan will launch a joint degree program next year as part of efforts to expand academic exchanges, the Education Ministry said Sunday.The Education Ministry and the Korean Council for University Education announced 10 South Korean colleges and universities chosen to partner with Chinese and Japanese universities under the Campus Asia program.The program is an Asian version of the Erasmus Mundu..
* Link : http://www.koreatimes.co.kr/www/news/nation/2011/09/117_95313.htmlAn international team of scientists led by a Korean professor said Friday that a rise in air-borne contaminants causes pollution levels in the ocean to go up, which eventually will affect marine life.According to Lee Ki-taek, a professor of environmental science and engineering from the Pohang University of Science and Technology (POSTECH), the level of nitrate in South Korean waters has soared as much as eight-fold in less than two decades.The nitrate level in waters off the country's southern island of Jeju jumped fro..
* Link : http://www.koreaherald.com/national/Detail.jsp?newsMLId=20110925000272A new era in the relationship with Brazil began when agencies in Korea and Brazil committed their resources to a “partnership without borders.”Brazil and Korea’s first Joint Science and Technology Committee Meeting set up the fundamentals for synergistic collaboration.For Brazil Ambassador Edmundo Fujita, the joint committee meeting paved the groundwork for a new phase in the relationship, where the knowledge and innovation potential of both nations can be integrated.“Brazil and Korea are enj..
* Link : http://www.koreaherald.com/lifestyle/Detail.jsp?newsMLId=20110908000884From as early as 2014, anti-cancer stem cell treatment will be available through a joint firm established by Pohang University of Technology and Science and Catholic University of Korea, the schools said Monday.According to the joint venture “PoCaStem,” the treatment “GX-051” involved injecting adenovirus that prompts the anti-carcinogenic treatment gene, IL-12M, into a stem cell. The substance is reported to induce immune reactions to tumors and has been proved effective on metastatic cance..